For the first time in over 100 years, you can experience the natural wonders of Shady Dell. On May 6, 2016, its new Peter Douglas Trail was opened to the public. 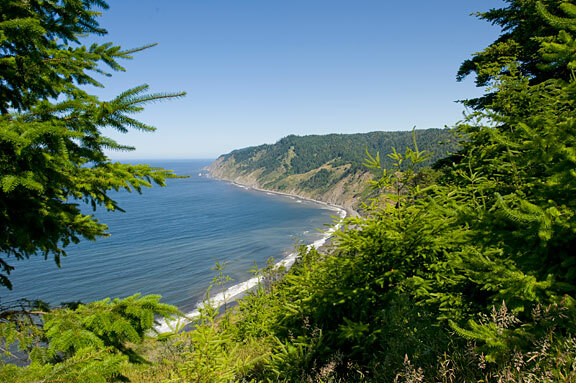 This trail, which extends the Lost Coast Trail to the south by 2.3 miles, makes it possible for visitors to explore the hidden gems of this legendary landscape, thanks in part to Save the Redwoods League donors. The Peter Douglas Trail showcases the diverse and spectacular treasures of Shady Dell while protecting its ecological integrity. As you begin hiking from the northern trailhead by Usal Creek and the Usal Beach Campground, you will ascend into the mystical grove of ancient candelabra-shaped redwoods, passing beneath their massive, tangled limbs. These unique trees, warped by wind and salty air, are breathtaking to behold. As you continue traversing Shady Dell’s rugged and scenic terrain, you will notice a rich array of plants and wildlife. The trail winds through redwood and Douglas fir forest, lush grassy bluffs, wildflower-strewn meadows, and over a creek that flows through tranquil alder groves. You can pause to relax on one of the benches overlooking the Pacific Ocean, and watch for passing whales. This is a magical and inspiring place to connect with nature. Get directions to the trail, and learn about seasonal highlights and hidden gems. The creation of this amazing trail is a testament to the incredible power of partnership. Save the Redwoods League worked with several partner organizations and individuals with the shared goal of opening Shady Dell’s awe-inspiring beauty to the public. With the management of our on-the-ground partner Mendocino Land Trust, crews from the California Conservation Corps, Americorps and Coastwalk California cleared and dug the trail. Talented local contractors led the construction of a bridge, boardwalks and over 300 steps. All of this was made possible with the support of the State Coastal Conservancy and members of the League, and the partnership of California State Parks and the California Coastal Commission. Louisa Morris, Director of Conservation and Trail Programs at Mendocino Land Trust, designed the trail to lead visitors through the best parts of Shady Dell and supervised the youths who built the trail. “One of the greatest things for me about this project is how inspiring it is to work with the young people who made this happen,” Morris said. This special trail is dedicated in honor of Peter Douglas, the former executive director of the California Coastal Commission and coauthor of the landmark 1976 Coastal Act. Douglas is remembered for his passionate and effective advocacy for coastal protections, and for his saying that “the coast is never saved, it is always being saved.” It is easy for visitors to Shady Dell to understand why California’s coast is worth fighting for. After a winding 35-mile drive north of Fort Bragg on Northern California’s remote craggy coast, you reach a hidden road. Beyond it, shrouded in fog, beckons a magical redwood forest fit for the set of a fantasy movie. Sword ferns, moss and lichens blanket the forest in green. Delicate orchids and trillium accent the duff. The silence is so profound it’s as if the forest is holding its hands over your ears. For more than 100 years, this forest was a private, hidden treasure. Your generous gifts enabled Save the Redwoods League to buy the 957-acre Shady Dell in 2011 and plan its restoration. Now, with the new Peter Douglas Coastal Trail, we have opened its wonders to you. But our work at Shady Dell has just begun. Logging in the 1800s, 1950s and 1980s damaged this landscape. Before logging, this land embraced giant redwoods, clear streams and diverse, native plants and animals, including now-imperiled salmon, northern spotted owls and birds called marbled murrelets. These animals depend on ancient forest habitat. Our vision is to help restore the forest features they need. Please give today through our secure webpage or call (888) 836-0005. One problem at Shady Dell is erosion. “Rainwater normally runs through the duff and percolates through the soil,” said Todd McMahon, League consultant, forester and expert on the area. Unpaved Usal Road winds through the forest, capturing and accelerating water and dumping sediment into Shady Dell’s streams. Additional logging roads and landslides also have sent tons of sediment flowing into the forest’s creeks. More fish in the salmon family (“salmonids” such as coho and steelhead) once relied on the creeks here. But sediment has buried much of the gravel where the fish used to lay their eggs. Logging removed trees that would have fallen into the streams, creating pools in which fish escape fast currents and hide from predators. Such habitat loss throughout the redwoods’ range has pushed salmonids to the brink of extinction. In turn, the forest suffers from salmonid loss because the trees depend on nutrients diffused from the fishes’ bodies after they spawn and die. To fix to these erosion problems, the road must be reshaped to reduce the flow and velocity of water, and sediment that eroded from the logging roads into the streams must be removed, McMahon explained. Another problem for salmonids is a culvert that altered the course of Shady Dell Creek, creating a maze of shallow channels that makes it hard for the fish to find their way to their spawning area upstream. One solution is to replace the culvert with a bridge. “A bridge would reverse the unnatural stream conditions created by the culvert and create channel more conducive to fish passage,” McMahon said. An additional challenge is the dense groups of trees that grew after logging, competing so much with each other for light, space, water and nutrients that most will remain small. We have cleared some of these small trees up on the ridge to prevent wildfire from reaching the rest of the property. We plan to cut more of the small competing trees to speed the growth of bigger trees. “This will accelerate the development of ancient forest conditions that provide beneficial habitat for imperiled wildlife species such as the northern spotted owl,” said McMahon’s colleague Tom Smythe, a League consultant and forester. Your gifts will help protect and heal this land for current and future generations to enjoy and make the forest a better home for imperiled wildlife. Please learn more and give today through our secure webpage or call (888) 836-0005. Thank you. Down a steep slope stand scores of ancient redwoods shaped into grand candelabras by fire, salty air and coastal winds. Instead of growing into massive straight columns, stressors caused these trees to sprout branches near the ground that droop like velvet ropes in a theater. Then when conditions improved, the branches grew straight up. Explore this strange and beautiful forest with the gallery below. Shady Dell harbors a redwood grove that takes your breath and defies belief. Just a few feet off the ground, the trees seem to have been split into a dozen trunks, each reaching to the sky like haphazard candelabra. The medieval “Enchanted Forest” as it’s known by locals, is important for forest science. Strong winds and salty air are believed to have shaped the trees, which are close to the coast. Because of its steep topography, the Lost Coast contains several ecological zones at multiple elevations from the sea to the ridgeline. The steep slopes of Shady Dell link the sea and the land with a diverse ecosystem. Shady Dell’s diverse ecosystem includes a rich array of wildlife such as salmon, black bears, Roosevelt elk and mountain lions. “Redwood forests depend on fog water coming in off the ocean, and then they create habitat for salmon to spawn,” Burns said, explaining that the trees shade streams and filter sediment to provide the cool, clear waters that the fish need to reproduce. “In turn, the redwoods get nutrients from fish that come up from the ocean,” Burns said. After salmon spawn in redwood forest streams, they die, and the trees absorb the nutrients from their bodies. One of the most compelling aspects of Shady Dell is its potential to rejuvenate California’s flagging coho or silver salmon. Coho have been steadily declining in California. Most estimates put them at less than 10 percent of historic levels. For example, in 1945 one surveyor pulled out more than 60,000 juvenile fish from Usal Creek, which runs next to Shady Dell. Today the number of Usal coho may be just in the hundreds, but with careful restoration, this stream has the potential to support thousands of coho again. The Lost Coast is one of the most rugged, remote and wild places in California. Perhaps that’s why so many hikers and surfers consider it the best-kept secret in the state. From Shady Dell, you don’t have to look far to see the League’s work. With support from our generous members, the League helped protect valuable redwood lands in Sinkyone Wilderness State Park. This park has been created mile-by-mile since 1975 and now boasts 22 miles of hiking trails with some of the best camping spots in California — including some right on the beach. Mycotrophic flowers of Shady Dell, clockwise from left: sugarstick, gnome plant, spotted coral root and wintergreen. Watch your step in May and June! Poking up through the leaves and sticks on the forest floor of Shady Dell are the pictured flowers. Rare and often hidden in the shady mixed conifer and hardwood forests of the Pacific Northwest, these flowers are called “mycotrophs” (“myco” meaning “fungus” and “troph” relating to nutrition). Mycotrophs depend on fungi for food, unlike green plants, which make their food from sunlight, water and carbon dioxide. Learn more about these unusual plants on the US Forest Service (external link) mycotroph page. Mycotrophs get sugars from green plants through an intricate network of fungi that grow between the roots of the flowers and the trees. Connected by fungi and the sharing of food, these flowers wouldn’t exist in Shady Dell without their fungal and tree partners. Mycotrophs are rare because they only occur in places where the partner tree species and fungus are living. “But even more than that, we only have the chance to see them for a few weeks every year,” said Emily Burns, League Director of Science. If you have questions, or would like to learn more about the Shady Dell project, please contact Membership at (415) 820-5800 or membership@SaveTheRedwoods.org.